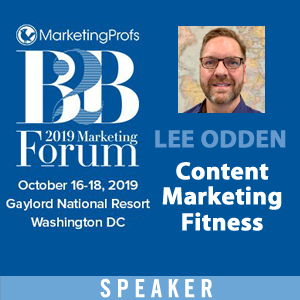 Plenty of bloggers are talking about the inevitable intersection of social media marketing and search engine optimization. Heck, we’ve been blogging about SMO since 2006! 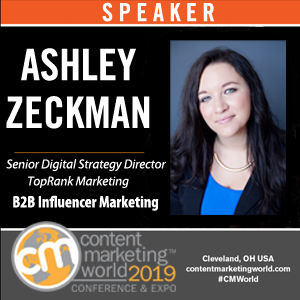 Keyword optimized social content and channels of promotion provide abundant signals to search engines for improved visibility on standard, social and real-time search. Below are screen shots of each tool with a more detailed description of how you might use them. HowSociable is a useful tool to quickly gauge the social presence of a particular keyword or brand name. 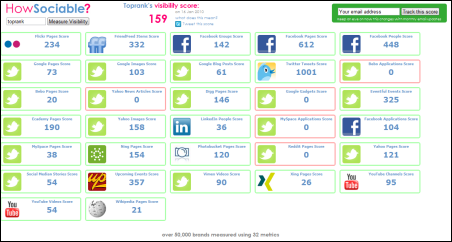 Agencies like TopRank Marketing will use this kind of tool (customized) to take snapshots of customer social presence metrics for social media optimization programs. 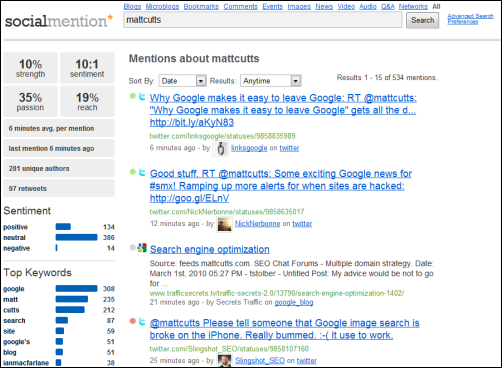 For each social site polled, you can clickthrough to see specific mentions. This is a characteristic of more advanced social media monitoring tools, but for those that want a quick glimpse, HowSocialble is easy to use and the price is right, just like these free social media monitoring tools. However, if you want more comprehensive brand search and monitoring, then a paid social media measurement tool is worth the investment. 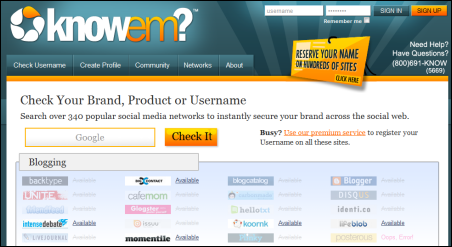 KnowEm is both a free and a paid service that will help you easily and quickly check whether your brand terms or other keywords have been registered as social profiles on a wide variety of social media web sites. Everything from blogging platforms to social news and bookmarking services are included. If you don’t want to complete all those profiles yourself, you can pay knowem to do it for you. Companies invest a lot in building their brand, so this tool is helpful both for creating off site promotion channels as well as guarding against brand name squatters. Social Media for Firefox is the only browser addon in our list and can be a handy tool to identify upcoming news items that are gaining popularity on certain social news and bookmarking services. 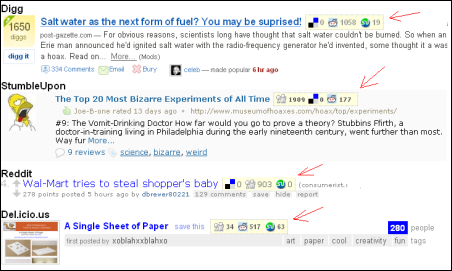 A big part of building a more influential user profile is to be a consistent source of submissions for articles that become popular. This addon helps identify articles that are becoming popular on services like Digg, Reddit and StumbleUpon giving you a heads up to submit to other services. The logic is that if a news item becomes popular on one service it has a good chance of becoming popular on others. Relevance, timing and focus are key as is patience for this kind of tactic. SEMRush is an interesting tool for identifying the keyword visibility, both organic and PPC, on Google for pretty much any domain name you might be curious about. Your own or competitors for example. 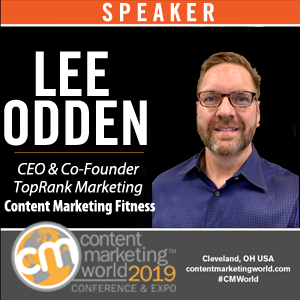 A common question for marketers is, “What are my competitors optimizing for?”. This tool helps uncover that insight and in combination with other standard and social keyword research, can be very helpful insight in a social media optimization program. Google Insights for Search is a handy tool to research trends in popularity of various keywords on their own or in combination. Filters for search type, geographic location, industry or topical category and timeframe allow you to refine some pretty useful information about what’s in demand. 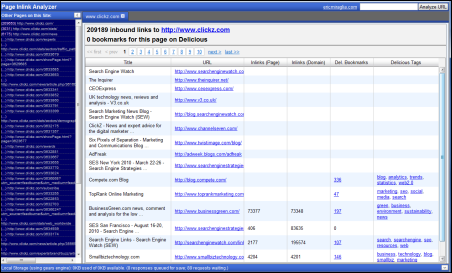 Eric Miraglia ‘s Inlink Analyzer is a back link analysis tool based on Yahoo’s Site Explorer that not only counts and displays source links to a particular URL, but it also shows if the source links were bookmarked on Delicious and what keyword tags were used. This kind of insight can be quite useful for understanding the relationship between social keywords and link popularity. It would be nice if there was a CSV export option. Majestic SEO is easily one of the most powerful and useful link analysis tools available. There is a free version that gives you link acquisition counts over time and if you are a site owner, you can get full reporting for your site once you validate it. If you use the paid service, you can get the juicy link details on your competition. This tools is useful for finding high impact links for standard SEO but it’s also useful for finding out which social media sites your site or competitors’ site are getting the most links from. Also, which of your own social destinations (blog, Facebook, Twitter, etc) are getting inbound links and from where. SocialMention is a free real time and social search tool that offers an array of search options (just blogs, just forums, just bookmarks or all) and output in the search results. You can get an indication of basic sentiment and the top social keywords associated with your query. As a free service, you don’t setup an account and save your search results, but you can easily download them into a spreadsheet. This is probably one of the most useful, free social search tools online. Bit.ly URL shortening is very handy since they’re included as a default service on Twitter and many other Twitter applications. Bit.ly is rock solid reliable with uptime, which is pretty critical when you’re relying on their URL redirect to send traffic to whatever it is you’re promoting. You can also get basic statistics for each URL that your shorten to show how productive the site is where it was shared. In today’s succinct social web with Twitter, status updates and micro-content, being able to conserve space with a reliable URL shortener is very helpful. Stats on top of that make this a “go to” URL shortening service. PostRank offers a nice measure of engagement at the individual document level and if you pay attention, you can get that data on any web site in their database, not just your own. 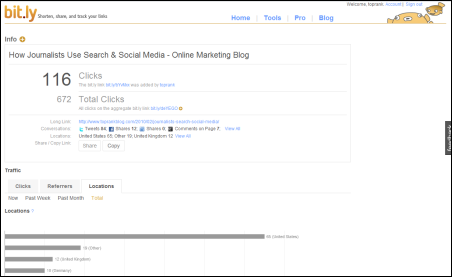 You can easily see what content on your competitors blogs are getting popular and where. 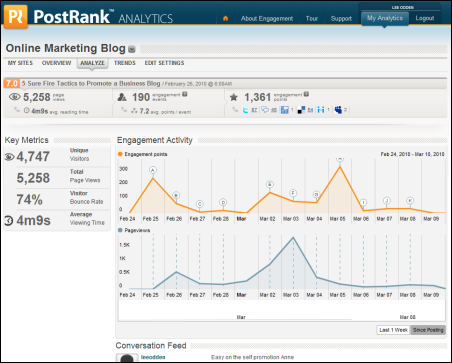 If you sign up for the PostRank Analytics service, you can incorporate Google Analytics data with social engagement metrics. These are essential comparisons in a social media optimization program and can help you understand where to plan your time on the social web. This is really just the tip of the iceberg when it comes to SEO and Social Media Marketing tools. What low cost or free tools have you found to be effective for social media optimization tasks? Personally I want tools that load online without requiring browser addons, extensions, toolbars, or downloads. That way I can continue to refrain from adding potential security holes to my personal computer. For example, Firefox always includes a disclaimer that tells users to only use addons from developers that they can trust. I appreciate that Ann and that's why only ONE of the 11 tools mentioned in the list above is a an add-on. I would have to say I agree with Johan on this one, howsociable.com is pretty sweet. Now off to re-check out a few of the others to see which ones work best for me. Very helpful article and resources – I've been looking into them already and they're great! Thanks for the great read. Please stop calling it Social Media Optimization. Check out my blog post on the topic http://ow.ly/1gzxm. It should be natural and not contrived. I don't care what you call it. Thanks for aggregating some good tools. The demystification continues! Good post , especially the howsociable.com is good find. Keep it up as usual. Lee, I am well aware of the history of the term. His post just caught my eye because of the relevance to SEO. Just because it has been around for a while doesn't mean I have to use it or even like it. Great post, and useful tools. Josh, I agree that socialmention isn't going to be as accurate as something like Radian6, SM2 or even Trackur, but for the price, it's still the most useful search of its kind. I would never use it for social media monitoring, mostly for social keyword research. Very true. I wasn't expecting it to be nearly as accurate as Radian6 or ScoutLabs, but I figured it would at least be somewhat accurate. Some free ones I've enjoyed are: Twitalyzer and OneRiot. Again, neither will replace Scout Labs for me, but for freeware, they were pretty decent. Just wanted to Add SEO Quake, a Firefox plugin that incorporates some of these tools in one. Social searches, seo, page rank, etc. I find it useful. Can be annoying though cause there is a frame that always appears. Thanks Barbra, I was trying to avoid plugins but I agree SEO Quake is useful. BTW, I was just reading your posts on personas and content mapping. Well done! Sweet! I always like posts with nice clear screenshots. I've used Bit.ly and Google Insights for a while, but I hadn't come across Trackur yet. I'll give HowSociable a few tries too. It's a really good list! Worth trying them, althought the free ones tend to be less reliable. Thanks Daniela. I agree free tools can often be less reliable or accurate, but most of the free tools in this list are the freemium versions of paid services. 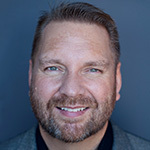 That type of free tool as part of a sales offering is often much more reliable and accurate than a pet project. Free is suppose to be juciy enough to get one buy premium services. So many people get by on free versions of the above mentioned services and even make SEO decisions on limited reporting, which is the scary part. For many SBOs, deciding on what to invest in is sometimes a challenge, especially if he or she is attempting DIY SEO. Better to have some reporting than none at all at the end of the day! Bit.ly looks good to be tried. 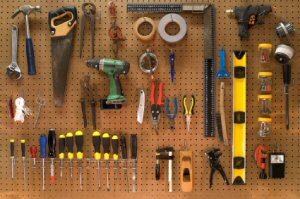 Great list of tools. 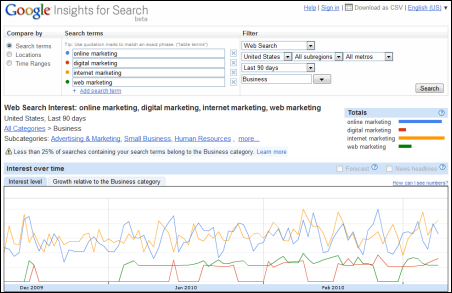 Google Insight is a tool we use a lot to see research keyword trends. As others have said this is a very helpful collection of sm tools and these many comments and remarks have also been insightful. Meaty post! Even to find what does or does not work for our strategies is valuable. Thanks! The only tool I’ve never used was HowSociable, it is cool but it would be nice if it worked for smaller brands. Just starting out, and felt I had learned quite a lot already, but see several tools, I haven't yet used… back to work I go. 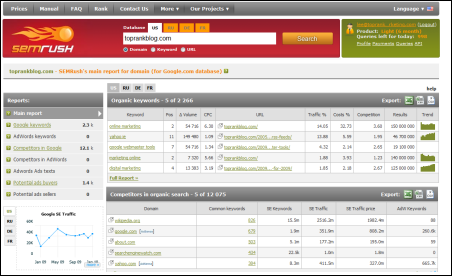 HitsLink is my favorite for tracking referrals and overall traffic & conversions. Not free, but reasonable at $39/month. This is great information! For just basic back link checks I use Yahoo Site Explorer. But these are great sites when more analytics are needed. What’s your favorite one that you use all the time? Top tools for me are WordPress, Email, Twitter, Facebook and of course Google. All the TECHNICAL INFO is very simply yet promptly put. Great post! Thanks for sharing social medial tools you know. It seems like more and more tools are coming out for social media. I could only say that the phenomena continues! Thanks. Great list of collection.. I will follow and implement in my work.. Thanks for the useful list..
i think it is so great site for seo, and so many tool which is help for any one, i like it. Really informative article. Didn't know a few of these even existed. Howsociable.com is what am gonna try out next. Very handy tools but i think Google Analytics is best if we compare it with all other tools, anyways its my personal experience. I really enjoyed postes on this blog. Thanks for this list, Lee! Even if you are a staunch user of Google Analytics or any other SEO measurement tool, it's always interesting to explore what's new. You never know what you might find that could be supplemental to the tools you already use. I, for one, can't wait to give some of these a try. One of the best, Twitalyzer (also free) is missing. Have you looked at that? Could you please review my new social media monitoring tool. I have just released the first BETA version of this free social media monitoring service. This free SMM / SEO tool will crawl the top 20 social media websites for your URL exposure and will make an online profile. Although I hope you just want to review it, it could be good for SEO too as it contains a backlink to your website . Thanks in advance and please reply me your thoughts, desired features, add-ons. I want to add more features to this free tool. Thanks Wristmarketing! Let me know if you know some nice add-on features for this tool. I just used it to check for mentions of my jewellery site, http://www.didihandmadejewellery.co.uk and found it very comprehensive. It also told me I need to promote it on more sites! But not today. Today I am working on my market report on using social networking sites for marketing. I should practise what I preach. Thank you for this post, great value. This is a great post. I've been frequenting social media sites, for personal and businesses use, for several years now and it never occurred to me to actually pay attention to the numbers associated with these sites. I will bookmark several of these sites right away. Thanks! 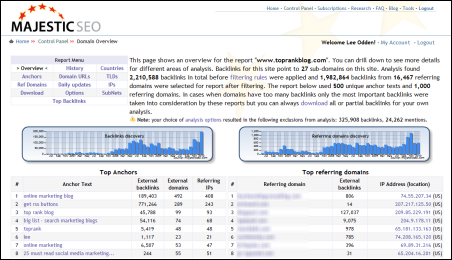 I love bitly and also use SEOBook to track backlinks as it sits handily on my firfox browser toolbar. Great overview and insight on some very useful tools. Thank you for sharing. Really useful post thank you! It will be of great help! is is good adn i will eb back to read it again The ending to this game was odd. The Sabres needed to win in regulation to earn the No 2 seed, NFL jerseys so they pulled goalie Patrick Lalime with about 10 seconds remaining, the score tied and the Devils on a power play. The plan was to press for a goal, but it got off to a strange start when Lalime collided with referee Steve Kozari soccer jerseys while heading to the Buffalo bench and both fell football jerseys to the ice. In the opening round of the playoffs, New Jersey Devils will meet the seventh-seeded Philadelphia Flyers, which beat the Devils in five of six games this season.World Cup Jerseys But it seems that all the members of the Devils just felt quite easy football shirts and relaxed. They have found the way they can play and they will stick to it.Who could have guessed World Cup Jerseys when he was born in the midst of its chill that a son of Moscow would emerge one day as the most popular athlete in that other capital city? great practical post – thank you! this is a nice list , i just want to say thanks for this , i have a blog http://social-catalog.com for which i want stuffs like that .